In my opinion the best part of the Big Game parties is the food. This year we needed something healthy, lets face it there is always a healthy option for everything, but yet extremely tasty. We decided on a chicken Alfredo flatbread. The last couple of times we’ve been out for drinks with the aunt, we’ve had chicken Alfredo flatbread. It was good, but I thought I could improve it. What better time for a debut than the Big Game? 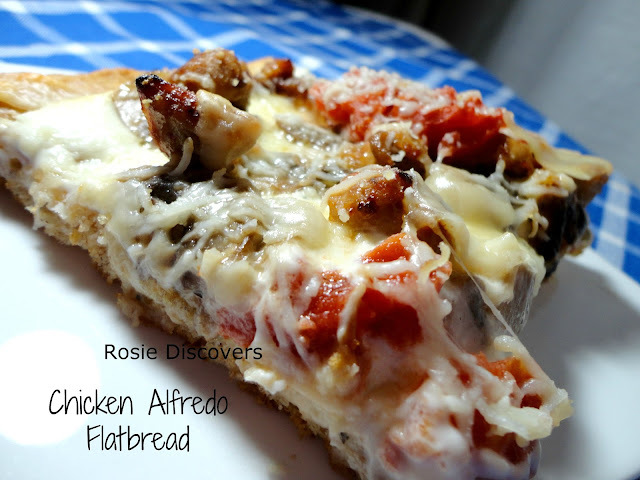 Chicken Alfredo flatbread is the perfect game food because you can grab a slice and go just like with pizza. I headed out to Walmart to find some Classico whole peeled pear tomatoes with fresh basil. Why Classico you ask? 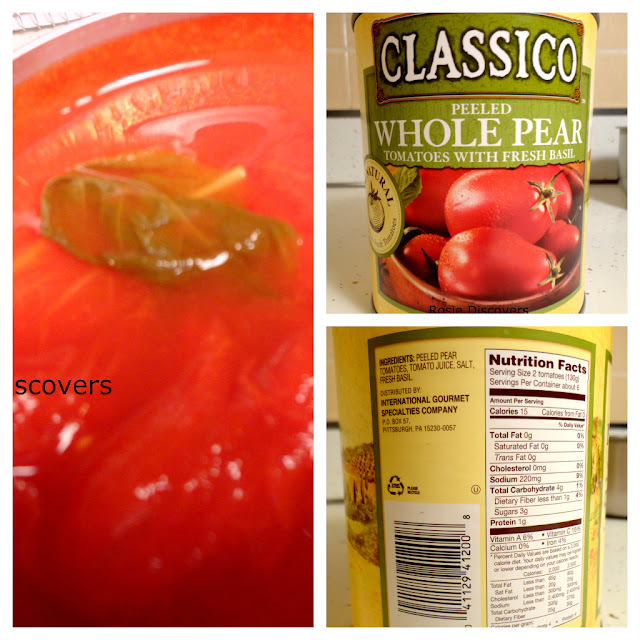 Classico canned tomatoes are pretty new, I’ve heard great things about them and they’re 100% natural. Just look at the ingredients! There are just four; tomatoes, tomato juice, salt and basil. My recipe doesn’t need an entire can of tomatoes, but I’m sure I’ll find something else great to make with them. The first thing I saw when I opened the can was a beautiful bright green basil leaf. YUM! The gorgeous basil canned with the tomatoes makes me feel great about using them and serving them to my guests. I don’t cook with canned tomatoes as often now because their acidity bothers Susie. The flat bread turned out great with a crisp, crunchy crust and just the right amount of sauce and toppings. Definitely a huge hit at our party! Almost all of it disappeared within minutes. Grease a 10 x 15 inch baking sheet with olive oil. Place all ingredients in mixer and mix on medium speed for 1 minute. Add garlic and herbs and mix until just incorporated into dough. Dough will be very wet and sticky. Spread on greased pan using damp hands. Let rise until puffy about 30-60 minutes. Bake at 375°F for 20-25 minutes till lightly golden. Place diced chicken thighs in a bowl and cover with your favorite Italian dressing. Let marinate on counter at least 20 minutes. Meanwhile, thinly slice mushrooms. Heat nonstick skillet over medium-high heat with 1 tablespoon olive oil. Pan fry mushrooms until they start to brown, remove from pan. While cooking mushrooms, in a medium sauce pan add milk, 1 cup Parmesan and cream cheese. Heat on medium, whisking occasionally until smooth. Set aside. Use same non stick skillet you used for the mushrooms to cook the chicken on high heat. Add half of the chicken to the pan and cook till opaque. Add the rest of the chicken and cook until all the chicken is browned. The dressing leaves the chicken a little greasy. If you want less grease (we normally do) you can drain the chicken on paper towels. Spread 3/4 of the sauce on the flat bread. 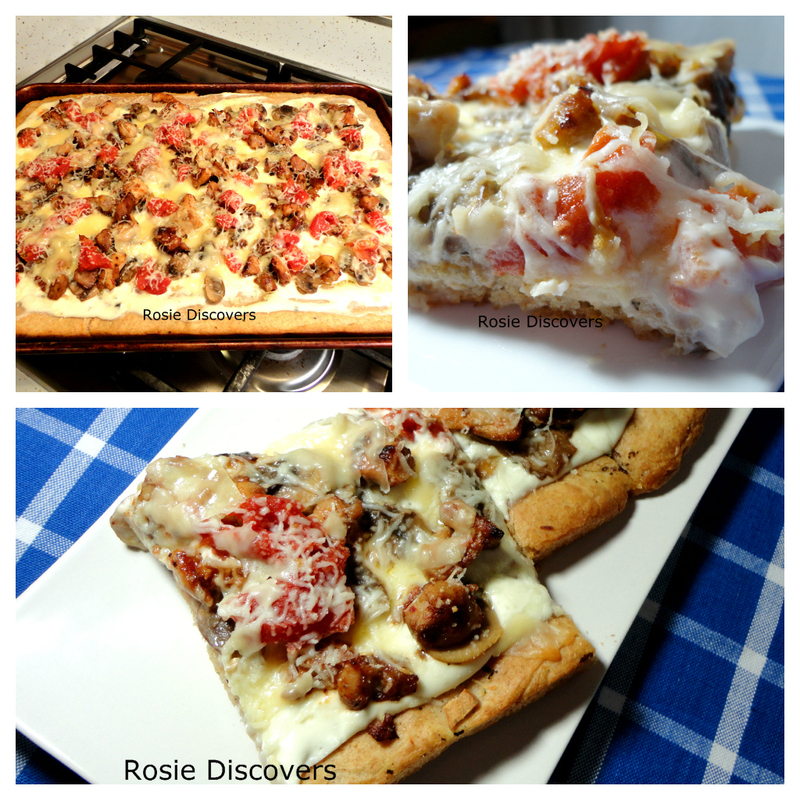 Top with mushrooms, chicken and tomatoes. Sprinkle with 1 cup Italian cheese and 1/4 cup Parmesan. Bake at 350°F for 10-12 minutes, or until cheeses are melted. You can prepare all the ingredients up to the assembly step and then assemble the day of the party. The flat bread will need to be baked longer. I am a member of the Collective Bias® Social Fabric® Community. This shop has been compensated as part of a social shopper insights study for Collective Bias® and Classico #cbias #SocialFabric #CookClassico. All opinions are my own. Yum! I love chicken Alfredo! I will have to give your recipe a try! Me too! This quick Alfredo sauce tastes just like the real thing with less fat involved. THis looks really good!!! I think I will be making it soon! Thanks, Melissa. It was a huge hit at my house for the Big Game! Yum! that looks so good! Thanks for sharing. I'm gonna have to try this someday with my son. I love flatbread, yours looks delicious! I especially love the crust. It stays nice and crispy unlike most flatbreads I've had. Thanks! It's a great way to have a more party friendly version of Chicken Alfredo.